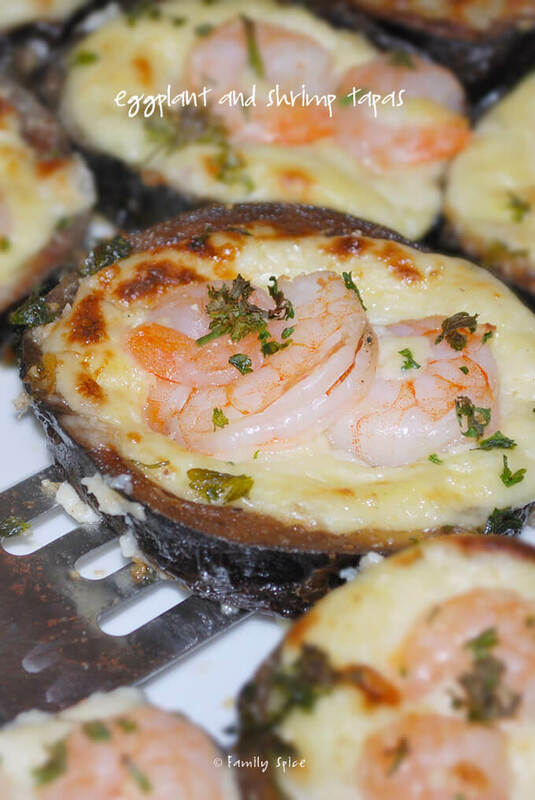 This Eggplant and Shrimp Tapas with Manchego Cheese includes a slice of fried eggplant topped with creamy manchego cheese sauce with a bit of shrimp to top it off. I love appetizers. When I go to a party with a heck of an appetizer spread, I go to town. In fact, I prefer appetizers to dinner. I often skip dinner because I stuffed myself with so many delicious starters. I definitely think the Spanish got it right with their Tapas spread. Just hang out with a never-ending glass of Sangria and enjoy the constant plates of Tapas coming to the table. Heaven. 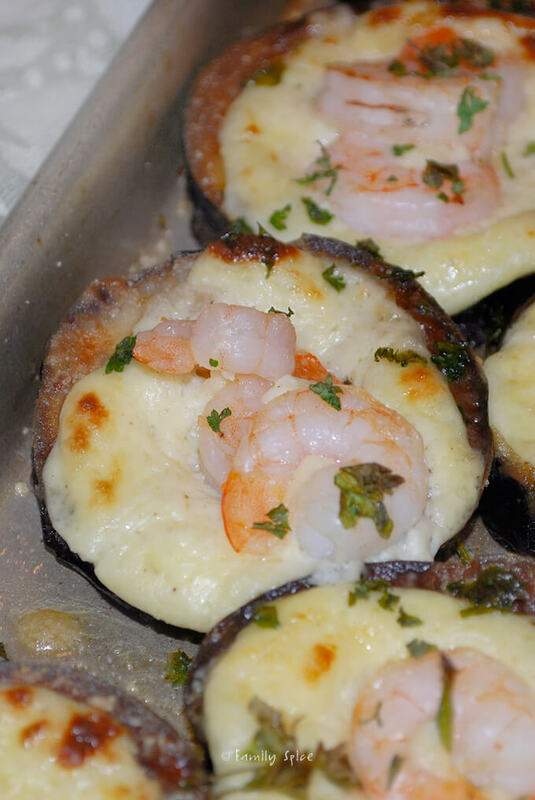 This recipe for Eggplant with Cheese and Shrimp, came from a wonderful cookbook I found at Williams-Sonoma, before kids. 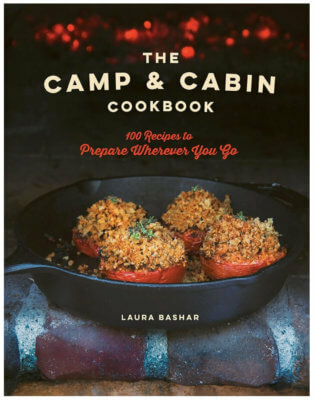 The Tapas Cookbook. The name says it all! Great pictures and fantastic Tapas recipes from Spain. Most are easy to put together. This one takes a few more steps than most, but it is oh-so worth it. I made these for our annual Christmas Eve party (yes, I’m FINALLY posting the recipe). Either I didn’t make enough, or they were THAT good, but when the last guests arrived to the party, there were none to offer! You begin by cutting you eggplant into 1/4-inch rounds, sprinkle with salt and let it rest to draw the moisture out. Next, you dredge the rounds through flour and fry them up. The cheese sauce starts with a simple roux, where you add milk and manchego cheese to create the creamy sauce. When the sauce is done, stir in some already cooked shrimp, top them on the eggplant rounds and bake at 400ºF for 15 minutes. Top with parmesan and parsley and watch these disks of deliciousness disappear! Mmmmmm….. I wish I had some now, actually! And for your next party, skip the main course and just serve Tapas! Olé! Leave for 20-60 minutes to remove excess moisture. Pat eggplant rounds dry with paper towels. Press both sides of eggplant into the flour, shaking off any excess. 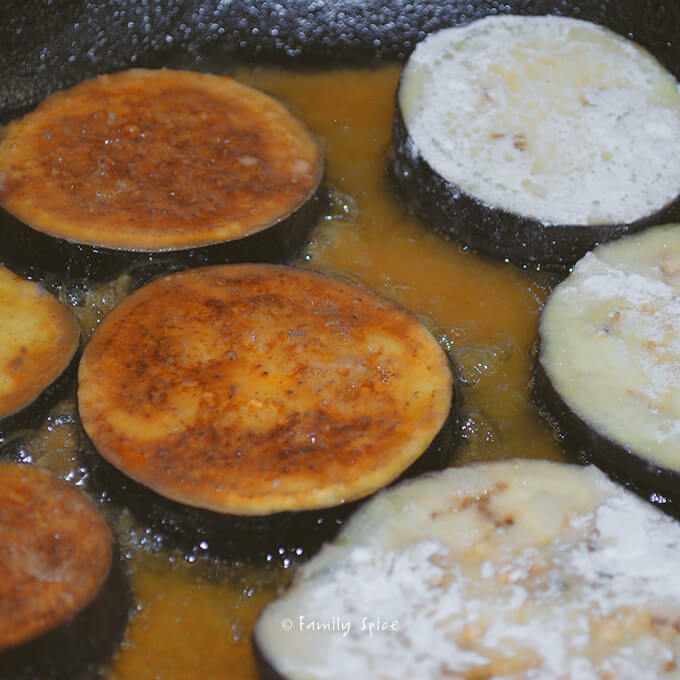 When oil is hot, add sliced eggplant, making sure you don't over-crowd the pan. Fry until golden, about 3-5 minutes and flip over to brown the other side. Remove and drain on a plate lined with paper towels. Fry remaining eggplant slices and drain on paper towels. 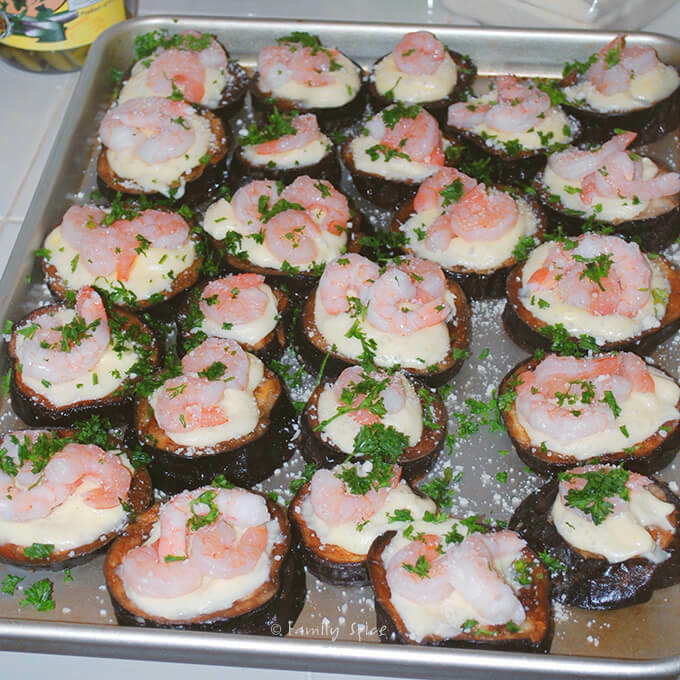 Arrange slices on eggplant slices on a baking sheet. Stir and cook gently to form a paste. Continue to stir until smooth. Heat over medium-low heat for 20 minutes to cook the flour. Pass through a strainer and discard the solids. Stir until cheese has melted and remove from heat. Spoon the cheese and shrimp sauce over each eggplant round. Cook in the oven until golden-brown, approximately 15-20 minutes. Serving Suggestions: You can also try this with crab or crumbled Italian sausage. If you can't find manchego cheese, you can substitute with parmesan cheese. 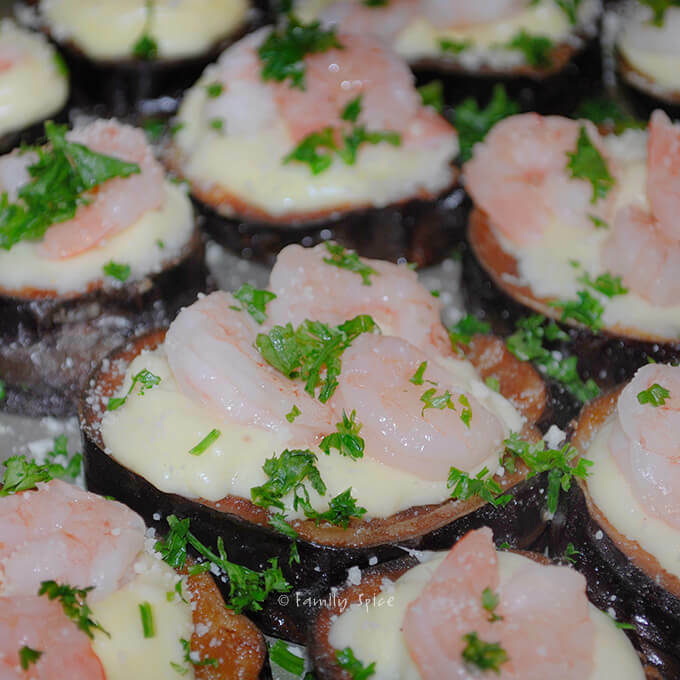 If using large shrimp, cut into small pieces first and then add to the cheese sauce. Cooking Tips: Instead of frying the eggplant you can also bake it. Brush each slice of eggplant with olive oil and bake on a baking sheet at 385ºF for 20 min, flip over and bake for an additional 20 min. What a beautiful appertizer….all my favourites there!